Wow, just found this site as I was researching portable ice shacks. When I do searches, I'm always looking forward to finding a new sites that shows a ton of responses on their forums. Right away I noticed how many were on the ice fishing forum. Decided to dive in and after almost 2 hrs of reading, I'm on the wagon. So here I post saying you all have a great site with very active members. 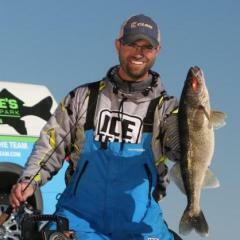 I even noticed a popular name off one of my other favorite sites, Walleye Central. The infamous Backwater Eddy...assuming the same alias of course. This site reminds me of HotSpotOutdoors with so many active people in a local flavor. Before you welcome me aboard, I must admit I am a cheesehead by birth, but with 100% Yooper blood. Therefore, I must offer my condolences to the Vikings and come out early to say I am a Packer fan. With that said, I truly have enjoyed my, now 2 1/2 hrs, and look forward to reading more. The great people of Minnesota are the kings of ice fishing and I value your input. Thank you as I have learned a lot tonight. What part of Yooper land are you speaking? I went to school in Houghton and did a lot of fishing and hunting in the U.P. Welcome Aboard Big Sky!!! You will love it here! I have learned so much since I found this place.The Fishing Minnesota Pro Staff is awesome and will help you in way they can, as will all the members here.Hope to see ya on the boards. My parents are both from Houghton. Well actually, my dad is from Hurontown. My mom grew up right across from Tech's campus. Spent many summers up there as a kid. I now own 40 acres off the Pilgrim River. Great area. This site is indeed addictive. As I left this site early, I went to some of my favorite other sites and was compelled to come back. Why I haven't heard of this before surprises me? There are so many that post here. Just a wealth of knowledge it appears so far. I got excited enough from a post about Mickey Mouse boots that I ran out to my truck to see if I had the real ones or some knock-offs. PS. Yes the Vikes did give us a HUGE xmas gift. Who would've thunk that outcome? I agree completly, this is an exelent site. The knowledge i've learned here in the past few weeks would have taken me years to aquire. I can get reports from my local area as well as having a heads up when heading to SD or WI to see the relitives. A hearty Thanks to the active members and staff of this site. first of all i want to thank all that put your knowlege on here.i am also a newbie and dont really need to be told exactly where to fish but, some general facts do help.i've learned more in a few hours here than i did in the weeks i tried by myself just guessin out on the lake.thanks guys! Welcome to Fishing Minnesota everyone! Welcome to all of the new members. There is a ton of info to be had here to search through, and dont be afraid to ask questions you may be suprised at the amount of answers a question can generate. Please dont forget all of the great sponsors here, and take the time to check out there websites and try some of the great products they offer. Pull up a chair boys! Welcome aboard. You might want to sit your wifes down now and explain a few things to them. You will be visiting the computer more often, you will be tromping off to new lakes in new places with new people, and no you dont need therapy (yet!) . You are now addicted but there is good news there is are support groups. Below is listed two of the support groups web sites. Welcome to the site Big Sky and Havok12th! Havok12 and Big Sky... Welcome to the real world! Welcome aboard, Lots of good info, Im a Viking fan Now Im a packer fan go packers. This forum is addicting, my wife sees me on here and says dont you have a job to do!! I have to agree this site is awesome. I'm new to ice fishing and I've learned a lot from everybody on here in the last couple of weeks.